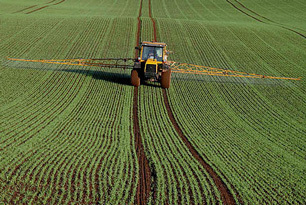 MCPA (4-(2-methyl-4-chlorophenoxy)acetic acid) is an herbicide used to control a wide spectrum of broad-leaf weeds around grains and other agricultural crops, residential lawns and turf, pastures, vines, forests, roadsides and other rights-of-way. It exists in four forms: an acid, a dimethylamine salt, a sodium salt, and a 2-ethylhexyl ester, but it's mostly commonly used in its acid form. It's classified as a chlorophenoxy herbicide, along with 2,4-D, and is often used in combination with other herbicides. MCPA has been detected in surface waters in the United States. MCPA is only moderately toxic with acute exposure, though large amounts can cause symptoms of “slurred speech, twitching, jerking and spasms, drooling, low blood pressure, and unconsciousness,” according to the Extension Toxicology Network. Animal studies have shown long-term affects on growth rates, reproductive problems, and changes in liver and kidney weights. According to the International Agency for Research on Cancer, data remains inadequate to determine carcinogenicity, but studies so far have suggested that it is not a carcinogen. According to the World Health Organization, MCPA may be treated with granular activated carbon (GAC) or ozonation.